Why leave your room when you can enjoy panoramic views of Darling Harbour while still in bed? The Harbour View Studio Suite at the Hyatt Regency Sydney offers an exclusive retreat with floor-to-ceiling windows showcasing the sparkling waters of Darling Harbour. The king bed has premium linens and showstopping views, and the flat-screen TV is equipped with Miracast technology. There's a sitting area where guests can work or relax with a morning cup of coffee from in-room coffee and tea making setup, minifridge, and a large in-room safe. In the bathroom there's a luxurious freestanding bath, walk-in shower, and plush terry cloth robes and slippers. Plus, guests of the suite receive Regency Club access privileges. Read more below the photo of the Harbour View Studio Suite. As Sydney's largest premium hotel, the Hyatt Regency Sydney offers a central location adjacent to Darling Harbour in the city's Central Business District. Providing an ideal base for business and leisure travelers, the modern luxury hotel has multiple restaurants including the Sailmaker Restaurant with all-day dining. Continue reading below the photo. It's also home to one of Sydney's oldest pubs, the Dundee Arms. For cocktails with a view, The Zephyr Sky Bar is a destination rooftop bar. While the Regency Club lounge provides and exclusive setting for daily breakfast, all-day refreshments, and evening cocktails with Darling Harbour views. Introduced in 2017, the new Pool Premium Overwater Villas at InterContinental Bora Bora Resort & Thalasso Spa are an ultra-romantic addition to the property's collection of luxury overwater bungalows. The recently unveiled one-bedroom villas have sundecks with shaded terraces, sun loungers, freshwater showers, private plunge pools, and direct lagoon access. Featuring contemporary design infused with Polynesian accents, the villas offer 1,507 square feet of space, which is able to accommodate up to three adults or two adults and two children using the sofa bed as bedding. Within the luxurious bathrooms there are showers, double washbasins, and a range of complimentary amenities. Plus, there are soaking tubs with picture windows providing idyllic views for guests as they soak in the tub. While the living rooms have large picture windows overlooking the beach, as well as glass coffee tables that reveal views of the colorful tropical fish below. Continue reading below the photo of the Pool Premium Overwater Villa. The InterContinental Bora Bora Resort & Thalasso Spa recently completed a multi-million dollar renovation, adding the Pool Premium Overwater Villas and Two-Bedroom overwater villas, as well as refreshing amenities and accommodations throughout the property. The Deep Ocean Spa was the South Pacific's first thalassotherapy center, which incorporates seawater into wellness treatment, along with a fitness center, and relaxation lounge. Continue reading below the spa photo. For dining, the Sands Restaurant offers beachfront casual dining, the Reef Restaurant has authentic Polynesian and Mediterranean cuisine, and Le Corail (pictured below) provides a sophisticated setting for romantic dinners. While the Bubbles Bar mixes contemporary style with Polynesian materials for a stylish cocktail destination. The start of the new year is the perfect time to start planning adventures near and far. From bucket list destinations to weekend getaways, we've put together a list of our top 17 picks for places to go in 2017. Celebrating its 375th Birthday in 2017, this French Canadian city offers history, art, and a strong food scene. Designated a UNESCO City of Design, many of the birthday celebration events will be taking place during the summer months in the historic Vieux Montreal (Old Montreal). One of our favorite experiences is Cité Mémoire, where guests download the free app (available in four languages), and take a historically-inspired evening walking tour of the historic quarter while viewing projected images with sound and music through the app. For luxury accommodations in the heart of Old Montreal, Le Saint-Sulpice, is an all-suite boutique property with a center courtyard and contemporary restaurant next to the Notre Dame Cathedral, or Hotel Gault, a modern, art-focused property in a historic building. Selected as the first UNESCO World Heritage City in the U.S., Philadelphia is set to debut the new Museum of the American Revolution in the spring, along with new luxury hotels from Four Seasons, Study, SLS, and the W. Founded by William Penn in 1682, the city offers an array of historic attractions including the Independence National Historic Park with the Liberty Bell and Independence Hall. Spend the night overlooking the National Historic Park at the Hotel Monaco Philadelphia with a rooftop lounge and chef-driven restaurant, or stay at one of the country's highest rated hotels, The Rittenhouse Hotel with five star comforts, rich mahogany furnishings, and a landmark location. 2017 is the Year of History, Heritage, and Archaeology in Scotland. From landscapes carved by glaciers thousands of years ago, to towering castles, fine whiskey tastings to local delicacies infused with traditions and legends, the country offers a variety of sites and events to explore. Less than an hour southeast of Glasgow, New Lanark, a UNESCO site began as a purpose-built mill village in 1785, and was transformed in the 19th century by Utopian idealist Robert Owen, into the largest collection of industrial buildings in the world. A short drive from New Lanark, The Blythswood Square Hotel offers a Glasgow city center location, award-winning spa, historic Rally Bar, and classic Afternoon Tea. Another of the country's UNESCO sites is Edinburgh Old and New towns, with two distinct areas: the Georgian and neoclassical New Town and the Old Town with the medieval Edinburgh Castle. The Caledonian is a Victorian railway hotel offering views of Edinburgh Castle, along with an indoor pool, gourmet dining with Michelin-starred chef-prepared cuisine, and the Caley Bar. Perfect for museum lovers, Malaga is situated in Spain's Andalusia region. The birthplace of Picasso, the city is home to the Picasso Museum, Centro de Arte Contemporaneo, and a five-year pop-up of Centre Pompidou which includes art by Chagall, Kahlo, and Magritte. Centrally located, the new Gran Hotel Miramar opened in a 1926 Art Nouveau building across from Malagueta Beach with a massive spa scheduled to debut in 2017. The Molina Lario boutique hotel is located in the city's cultural center by the port and Picasso Museum, while the Finca Cortesin Hotel, Golf and Spa is located just outside the city with Andalusian architecture and a championship golf course. Following the opening of the 36-mile-long Gotthard Base Tunnel in December 2016 on the southern edge of the lake, this Alpine paradise offers an array of water activities during the summer, along with hiking, and regional cuisine. The massive Bürgenstock resort is set to open later this year. For a historic setting, the Palace Luzern is locationed on the lake, and offers special perks for Five Star Alliance Guests. While the Art Deco Hotel Montana is perched high above the lake with picturesque views of the Swiss Alps. Finland is Celebrating 100 years of indepence in 2017, and the country's capital city will be the hosting a variety of events, including the Worldcon 75 - World Science Fiction Convention in August at the Helsinki Convention and Exposition Centre. Combining contemporary Scandinavian style with a diverse history, the scandic city offers new Nordic cuisine, the Old Market Hall with local and regional specialties, outdoor recreation, and traditional Finnish saunas throughout the city. Spend the night in the city center at Radisson Blu Seaside Hotel Helsinki, set within a former dairy laboratory and cheese factory, or at the beautifully restored Hotel Kamp, across from Esplanade Park, as well as upscale shops and restaurants. Three of the city's iconic attractions: the Ryman Auditorium, Country Music Hall of Fame & Museum, and the Bluebird Cafe are celebrating major anniversaries this year. Plus, Music City U.S.A. has a booming food scene with John Besh's Marsh House, an eatery from Per Se-trained chef Julia Sullivan, joining a strong market of dining options in the past year. The city also debuted the Thompson Nashville in the Gulch dining and entertainment district, with a 21c, and Kimpton opening in 2017. For visitors wanting a historic setting, Nashville's Hermitage Hotel is a landmark destination since 1908 with the Capitol Grille and a regal setting. Set along picture-perfect beaches where two oceans converge, Cape Town is ideal for whale watching and water sports. Surrounded by the Cape Winelands of Constantia, Franschhoek, and Stellenbosch, the region pairs well with the city's growing restaurant scene. Cape Town's art and design scene is also strengthening with the opening of the Zeitz Museum of Contemporary African Art. The award-winning Twelve Apostles Hotel and Spa offers a waterfront setting, with a private helicopter pad, impeccable service, and a shuttle service to Cape Town's V&A Waterfront, plus special perks for Five Star Alliance guests. For a setting removed from the city, Bushmans Kloof Wilderness Reserve is less than a 3-hour drive, with a unique natural environment featuring waterfalls, open plains, and ancient sandstone formations, along with VIP status for Five Star Alliance guests. From the beaches in the Algarve region, to the chic city of Lisbon, Portugal offers vineyards, arts, culture, and a delectable culinary experience. Perched on a mountainside overlooking a UNESCO World Heritage town, the Tivoli Palacio de Setais is set within a castle built by the Dutch in 1787. The Hotel Quinta Do Lago is located within the Ria Formosa Nature Park, with direct beach access, outdoor pool, and spa. Olissippo Lapa Palace offers a retreat-like setting in the heart of Lisbon, while Six Senses Douro Valley provides a spectacular setting in Portugal's Duora Valley wine region. The capital of Western Australia, Perth is one of the most remote cities on the planet. But the city's restaurant industry is booming with historic buildings being transformed into swank cafes and chic cocktail bars. There's also a growing number of design-focused accommodations, including COMO The Treasury. Set within a 140-year-old State Building, the hotel has a rooftop Wildflower restaurant, COMO Shambhala spa, and indoor pool. Crown Metropol Perth overlooks the rolling hills to the east with a large resort pool surrounded by cabanas and day beds, spa with Swan River views, plus cycling and running tracks. Torres del Paine National Park offers breathtaking vistas and an array of mountains, fjords, and glaciers to explore. New flights from South American airline LATAM between Santiago, Chile and Puerto Natalas are making this region more accessible than ever. The luxury ecolodge, explora Patagonia is set within the national park, a UNESCO Biosphere Reserve, while Tierra Patagonia Hotel and Spa offers distinctive architecture overlooking the area's unique landscape. For exclusive access to mountainous terrain, as well as nearby farms and rivers, The Singular Patagonia is set on 100 acres and pays homage to the heritage of the region. This June, the island will host the 35th America's Cup sailing race, and the island is currently undergoing a redevelopment phase. The Hamilton Princess & Beach Club just completed a $100 million renovation, which included the addition of a Marcus Samuelsson restaurant, plus an art collection, spa, and revitalized guest rooms. Elbow Beach Bermuda is located along a stretch of pristine, pink sand beach, while Rosewood Tuckers Point is set amongst 200 waterfront acres. In celebration of the country's 150th birthday, all of Canada's National Parks will offer free entry to anyone who signs up for the Discover Pass. Ottawa will host a variety of events, and the Fairmont Chateau Laurier is in the center of it all next to the Parliament Buildings. Toronto is now more accessible via Air Canada's stopover program, and the newly opened Thompson Toronto offers a chic setting with a rooftop pool. Quebec City, North America's only walled city, is experiencing a renaissance, and the Auberge Saint-Antoine mixes history with a chic setting. While Vancouver offers a thriving metropolis on the Pacific Coast, fusing historic railroad hotels like the Fairmont Hotel Vancouver, amongst contemporary retreats such as the Fairmont Pacific Rim. The island's colonial city is expanding its offerings with new restaurants that transform into nightspots, a hip electronic music scene, and a variety of live music venues. Casas del XVI features 10 luxury accommodations spread throughout three historic homes, with an overall romantic, yet contemporary setting. The Hostal Nicolas de Ovando Santo Domingo is located within a former palace that has been transformed into a luxury hotel along the Las Damas, the New World's first paved road. Offering a new high-rise Suzhou Industrial Park with a shopping and entertainment district, mixed with the UNESCO-designated 2,500-year-old city known for traditional white-washed buildings and an Old Town with canals, this city mixes old with new. Just a half-hour bullet train ride from Shanghai, the historic city known for art and poetry is becoming a popular location, with multiple Western hotel brands opening properties in the next two years. The Pan Pacific Suzhou offers traditional Chinese architecture with renowned personalized service, and the Regalia Resort and Spa featuring a secluded setting with lotus ponds on Jinji Lake. Home to some of the world's most beautiful beaches, the Seychelles is a 115-island nation off the eastern coast of Africa. Popular with honeymooners, the islands are experiencing a boom in lavish resort openings. The newly opened Six Senses Zil Pasyon is an all-villa retreat on the private island of Félicité with an open-air spa and plunge pools. The Constance Ephelia Seychelles on the island of Mahe with contemporary furnishings, surrounded by gardens and ocean views, while the Constance Lemuria Seychelles has its own 18-hole championship golf course, and sits directly on three white sand beaches with four restaurants, children's club, and five bars. Emerging as the arts hub of the Hawaiian islands, the state's capital is hosting its first Biennial, March 8 to May 8, which will feature art installations, performances, and more around the city at the City Hall, Chinatown, and Foster Botanical Garden. There are new galleries and studios opening throughout the city, plus the beachfront hotels are right on the water, yet close to the attractions. Halekulani is located on Waikiki Beach with the 5-star Le Mer Restaurant and a mosaic-bottom swimming pool. The newly transformed Four Seasons Resort Oahu at Ko Olina is a sprawling property with an award-winning spa, marina, and family activities. Plus, the Royal Hawaiian, known as the Pink Palace provides a landmark setting on Waikiki Beach with classic beachfront dining. Offering a private balcony jutting over the pier with panoramic views of the Sydney Harbour, the Admiral Suite at the Pier One Sydney Harbour provides guests with incomparable views in a luxurious setting. The living area and bedroom combine classic style with historic furnishings from design houses in France and Australia, along with modern details like a Bose sound system, two LED flat-screen TVs, and a marble topped wet bar with a Nespresso coffee machine. One of the suite's finest amenities is the master bathroom. Featuring floor-to-ceiling windows with striking views of Luna Park, Sydney Harbour Bridge, and the Opera House, the modern soaking tub provides the ultimate spot to relax and soak in views of the city. Continue reading below the photo. 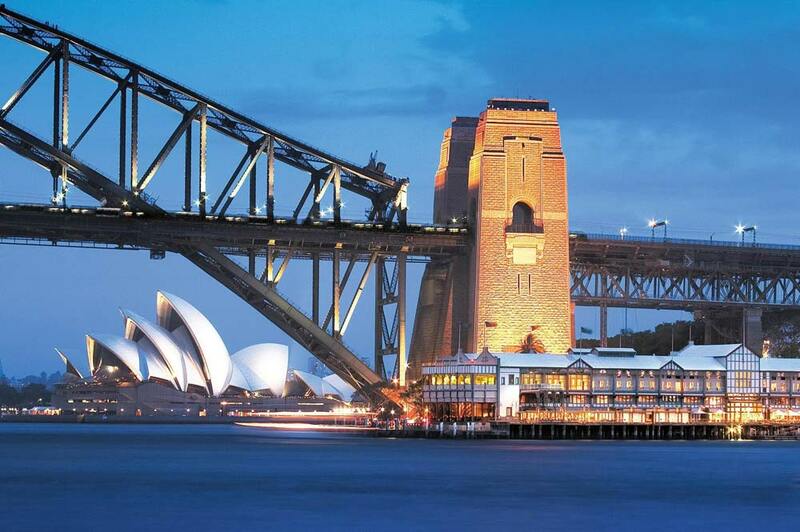 The Pier One Sydney Harbour is nestled along the Sydney Harbour Bridge, and blends Federation-style architecture with contemporary design. Guest rooms and suite have a nautical theme, accented by original timber and ironwork. The high end boutique hotel offers a unique setting in the heart of The Rocks, with historic dining and entertainment options nearby. Plus, the on-site Gantry Restaurant and Bar, wellness offerings, and in-room massage services. Set directly on the Great Barrier Reef, the Lizard Island Resort offers a luxurious retreat with 40 suites and 24 powdery-white sand beaches. Reachable only by private charters from Cairns Airport in Queensland, the island resort has the Salt Water restaurant serving five star cuisine, and Essentia Day Spa offering a variety of treatments and services. Right outside the doorstep, guests can snorkel and explore Australia's Great Barrier Reef. Five Star Alliance Perk: All guests making reservations with Five Star Alliance receive a $100 resort credit, VIP status, and depending on availabilty room upgrades, early check-in, and late check-out. If you're seeking a lakeside retreat away from the hustle and bustle of city life, yet yearn for contemporary design and modern comforts, the Azur Lodge in Queenstown, New Zealand is an ideal spot. Perched on a hilltop amongst native trees, with panoramic views of Lake Wakatipu and the mountains, the property offers nine villas and a lodge with three fireplaces, cocktails, and refreshments. Designed by local architect John Blair, the contemporary villas feature interior design by Singapore based LTW, providing an overall modern, yet relaxed feel. Offering complete privacy, all villas have private patios with scenic views, and gas fireplaces. There are plush beds with German-milled Egyptian cotton sheets by Ploh, as well as goose down pillows and duvets. Sleek bathrooms feature spa tubs with large windows to soak in the scenery, New Zealand-made Linden Leaves amenities, and rain forest showers. Nestled amidst rugged snow capped peaks of the Southern Alps on the shores of Lake Wakatipu is New Zealand’s finest Lodge – Blanket Bay. In 1861, a mob of sheep owned by Mr William Gilbert Rees were sheared on the shore of Lake Wakatipu, in a bay just south of where the small town of Glenorchy is situated. This bay was to be named Blanket Bay after blankets used to create the shed and shelters used to protect the eight Maori shearers and the wool from the elements.